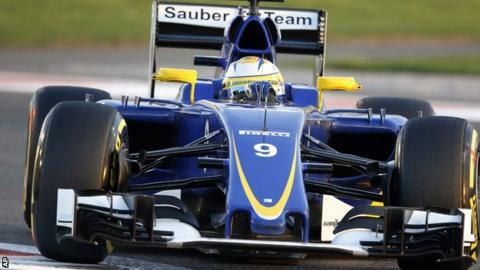 Swiss Formula 1 team Sauber will not run their 2016 car until the second and final pre-season test. The Australian Grand Prix was brought forward to 20 March, forcing teams to re-think their production schedules. But Sauber will stick with their initial plan, which means they will run a modified version of their 2015 car at Barcelona from 22-25 February. The 2016 car - the C35 - will appear for the first time at the second test at the same track from 1-4 March. The pre-season schedule has been cut from three four-day tests to two this year as part of an effort to control costs. The 2016 season was originally due to start on 3 April but was brought forward because of the need to cram a record 21 races into the calendar. Sauber will retain the same driver line-up as in 2015, with Brazilian Felipe Nasr partnering Swede Marcus Ericsson. Meanwhile, McLaren have become the first team to announce the date for the public unveiling of their new car. The Honda-powered MP4-31, which will be driven by Fernando Alonso and Jenson Button, will be unveiled online on 21 February.